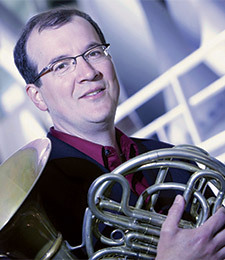 Greg Flint is associate professor of horn at the University of Wisconsin-Milwaukee. Prior to his UWM appointment in 2003, he taught horn at DePaul University and brass chamber music at his alma mater, Northwestern University. As a soloist, clinician, and chamber musician he has performed and given master classes in Spain, Costa Rica, Brazil, Columbia, Taiwan, and throughout the United States. Mr. Flint has been principal horn with the Elgin Symphony since 2001, where his performance of Richard Strauss' Concerto No. 1 was broadcast nationally. He has performed with the Chicago Symphony, Milwaukee Symphony, Ravinia Festival Orchestra, Grant Park Symphony, Colorado Orchestra, Honolulu Symphony and the Key West Symphony. In 2010 he appeared as guest principal horn with the Florida Orchestra. Greg has played numerous performances with the Lyric Opera of Chicago, including on-stage and off-stage solos, and several Ring cycles under the direction of Zubin Mehta. Mr. Flint currently spends his summers playing 3rd/Associate Principal Horn with the Santa Fe Opera Orchestra. An avid chamber music performer, Greg is a member of the award winning Asbury Brass Quintet, Tower Brass of Chicago, and the Fulcrum Point Brass Quintet. He has toured internationally with the Chicago Brass Quintet and the Prairie Winds, and is co-artistic director of the Chamber Music Milwaukee series at UW-Milwaukee. His long held position as first horn with the Chicago Jazz Orchestra has provided him opportunities to perform and record with such jazz luminaries as Clark Terry, Roy Hargrove, Nicholas Payton, Jon Faddis and Frank Sinatra. A much sought after freelancer, Greg has performed with The Three Tenors, Ray Charles, Aretha Franklin, Barry Manilow, Celine Dion, Stevie Nicks, Johny Mathis and Andre Boceli.